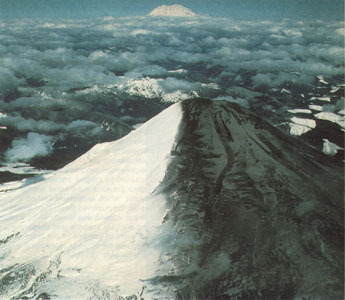 A view to the north of the "two-tone" mountain--an appearance produced by prevailing easterly winds during the initial activity of Mount St. Helens. Mount Rainier is visible in background (Photograph by C. Dan Miller). A magnitude 4.2 (Richter Scale) earthquake on March 20, 1980, at 3:47 p.m. Pacific Standard Time (PST), preceded by several much smaller earthquakes beginning as early as March 16, was the first substantial indication of Mount St. Helens' awakening from its 123-year sleep. Earthquake activity increased during the following week, gradually at first and then rather dramatically at about noon on March 25. The number of earthquakes recorded daily reached peak levels in the next 2 days, during which 174 shocks with magnitudes greater than 2.6 were recorded. Many hundreds of smaller earthquakes accompanied these larger events, the largest of which were felt by people living close to the volcano. Aerial observations of Mount St. Helens during the week of seismic buildup revealed small earthquake-induced avalanches of snow and ice, but no sign of an eruption. With a thunderous explosion, or possibly two nearly simultaneous ones, widely heard in the region at about 12:36 p.m. PST on March 27, Mount St. Helens began to spew ash and steam, marking the first significant eruption in the conterminous United States since that of Lassen Peak, California, from 1914 to 1917. The crown of the ash column rose to about 6,000 feet above the volcano. The initial explosions formed a 250-foot-wide crater within the larger, preexisting snow- and ice-filled summit crater, and new fractures broke across the summit area. 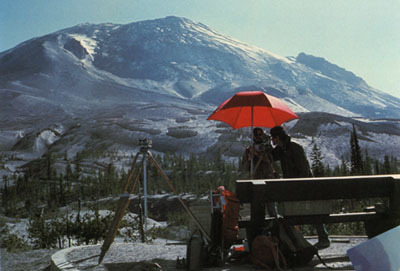 View of the "bulge" on the north face of Mount St. Helens, from a measurement site about 2 miles to the northeast (Photograph by Peter Lipman). The drawing above the photograph illustrates, in a highy exaggerated fashion, the nearly horizontal movement--about 85 feet in 20 days--of one of the measured points on the "bulge." Through April 21, Mount St. Helens intermittently ejected ash and steam in bursts lasting from a few seconds to several tens of minutes. The first crater was joined on the west by a second, slightly larger crater, and as the activity continued, both craters enlarged and ultimately merged. Several avalanches of snow and ice, darkened by ash, formed prominent streaks down the mountain's slopes. The effect of the prevailing easterly wind was striking during the March-April eruptive activity, transforming the snow-covered Mount St. Helens into a "two-tone" mountain. The ash blown out between March 27 and May 18 was derived entirely from the 350-year-old summit dome, shattered and pulverized by phreatic (steam-blast) processes driven by the explosively expanding, high-temperature steam and other gases. No magma (molten rock and contained gases) was tapped during the initial eruptions. Intense earthquake activity persisted at the volcano during and between visible eruptive activity. As early as March 31, seismographs also began recording occasional spasms of volcanic tremor, a type of continuous, rhythmic ground shaking different from the discrete sharp jolts characteristic of earthquakes. Such continuous ground vibrations, commonly associated with eruptions at volcanoes in Hawaii, Iceland, Japan, and elsewhere, are interpreted to reflect subsurface movement of fluids, either gas or magma. The combination of sustained strong earthquake activity and harmonic tremor at Mount St. Helens suggested to scientists that magma and associated gases were on the move within the volcano, thereby increasing the probability of magma eruption. Visible eruptive activity ceased temporarily in late April and early May. Small steam-blast eruptions resumed on May 7, continued intermittently for the next several days, and ceased again by May 16. During this interval, the forceful intrusion of magma into the volcano continued with no respite, as was shown by intense seismic activity and visible swelling and cracking of the volcano. The swelling was easily measurable and affected a large area on the north face of Mount St. Helens; this area became known as the "bulge," the initial growth of which probably began during the first eruption (March 27) or perhaps even a few days before. Through mid-May about 10,000 earthquakes were recorded. The earthquake activity was concentrated in a small zone less than 1.6 miles directly beneath the bulge on the north flank of Mount St. Helens. A comparison of aerial photographs taken in the summer of 1979 with those taken during and after April 1980 showed that by May 12 certain parts of the bulge near the summit were more than 450 feet higher than before the magma intrusion began. Repeated measurements begun in late April with precise electronic instruments that shoot a laser beam to reflector targets placed on and around the bulge showed that it was growing northward at an astonishing rate of about 5 feet per day. The movement was predominantly horizontal--clear evidence that the bulge was not simply slipping down the volcano's steep slope. As the bulge moved northward, the summit area behind it progressively sank, forming a complex down-dropped block called a graben. These changes in the volcano's shape were related to the overall deformation that increased the volume of the mountain by 0.03 cubic mile by mid-May. This volume increase presumably corresponded to the volume of magma that pushed into the volcano and deformed its surface. Because the intruded magma remained below ground and was not directly visible, it was called a cryptodome, in contrast to a true volcanic dome exposed at the surface. In summary, during late March to mid-May 1980, Mount St. Helens was shaken by hundreds of earthquakes, intermittently erupted ash and debris derived by steam blast reaming out of its preexisting summit dome, and experienced extremely large and rapid deformation caused by magma intrusion. The hot intruding magma provided the thermal energy to heat groundwater, which explosively flashed to generate and sustain the observed steam-blast eruptions. For 2 months the volcano was literally being wedged apart, creating a highly unstable and dangerous situation. The eventual collapse of the bulge on the north flank triggered the chain of catastrophic events that took place on May 18, 1980.